Deficiencia maxiliar transversal en adultos. Controversias sobre la disyunción palatina rápida asistida quirúrgicamente. Carlos Arismendi Hospital Central de las Fuerzas Armadas, Dirección General de Sanidad de las Fuerzas Armadas. disyunción palatina rápida asistida quirúrgicamente o SARPE por su sigla en inglés, es una técnica quirúrgica que ayuda al ortodoncista a resolver este problema en pacientes adultos. A pesar que su utilización esta ampliamente divulgada, desde su introducción por Brown en 1938, existen controversias con respecto a sus indicaciones, sus ventajas con respecto a otras técnicas para ensanchar la maxila, la técnica quirúrgica a utilizar, la causa y la cantidad de su recidiva, su efecto sobre la cavidad nasal, etc. En este trabajo, se realizó una revisión la literatura con la intención de discutir y clarificar algunos puntos donde aun existen controversias. de la Clínica del Parque. General de Sanidad de las Fuerzas Armadas. surgically assisted rapid maxillary expansion with lateral osteotomy. European Journal of Orthodontics; 26: 391 – 395. Atac A, Karasub H, Aytacc D. (2006) Surgically Assisted Rapid Maxillary Expansion Compared with Orthopedic Rapid Maxillary Expansion Angle Orthod; 76: 353–359. Baraldi C, Pretto S, Puricelli E. (2007) Evaluation of surgically maxillary expansion using acoustic rhinometry and postero - anterior cephalometry. Int. J. Oral Maxillofac. Surg. ; 36: 305–309. Basciftci FA, Mutlu N, Karaman AI, et al. (2002) Does the timing and method of rapid maxillary expansion have an effect on the changes in nasal dimensions? Angle Orthod; 72:118. Bays RA, Greco JM. (1992) Surgically assisted rapid palatal expansion: An outpatient technique with long-term stability. J Oral Maxillofac Surg, 50:110 – 113. Chuah C, Mehra P. (2005) Bilateral lingual anesthesia following surgically assisted rapid palatal expansion: Report of a case J Oral Maxillofac Surg; 63:416–418. Chung C, Goldman A. (2003) Dental tipping and rotation immediately after surgically assisted rapid palatal expansion. European Journal of Orthodontics; 25: 353–358. Chung C, Woo A, Zagarinsk J, Vanarsdall R, Fonseca R. (2001) Maxillary sagittal and vertical displacement induced by surgically assisted rapid palatal expansion. Am J Orthod Dentofacial Orthop; 120: 144-8. Gerlach KL, Zahl C. (2005) Surgically Assisted Rapid Palatal Expansion Using a New Distraction Device: Report of a Case With an Epimucosal Fixation; J Oral Maxillofac Surg; 63:711-713.
expansion: Sixteen cases. Am J Orthod Dentofacial Orthop; 86:207 – 213. Handelman C, Wang L, BeGole E, Haas A. (2000) Nonsurgical Rapid Maxillary Expansion in Adults: Report on 47 Cases Using the Haas Expander; Angle Orthod;70:129–144. Surgically Assisted Rapid Palatal Expansion (SARPE); J Oral Maxillofac Surg; 64:1313-1317.
assisted rapid maxillary expansion (SARME): a review of the literature. Int. J. Oral Maxillofac. Surg; 34: 709–714. Kraut RA. (1984) Surgically assisted rapid maxillary expansion by opening the midpalatal suture. J Oral Maxillofac Surg 42:651. Lanigan D, Mintz S. (2002) Complications of Surgically Assisted Rapid Palatal expansion: Review of the Literature and Report of a Case. J Oral Maxillofac Surg; 60:104-110.
study; Am J Orthod Dentofacial Orthop;120: 498-502. Mommaerts M. (1999) Transpalatal distraction as a method of maxillary expansion. Br J Oral Maxillofac Surg;37:268.
in non-congenital deformities. J Craniomaxillofac Surg; 30:139 – 143.
patient with a missing lateral incisor. Int J Adult Orthod Orthognath Surg; 11: 235 – 238. Persson M, Thilander B. (1987) Palatal suture closure in man from 15 to 35 years of age. Am J Orthod; 125: 313–321. Phillips C, Medland W, Fields H, Proffit W, White R. (1992) Stability of surgically maxillary expansion. Int J Adult Orthod Orthognath Surg; 7: 139 – 146. Orthod Orthognath Surg; 7: 37 – 41. Racey G. (1992) Surgically assisted rapid palatal expansion: An outpatient technique with long-term stability. Discussion; J Oral Maxillofac Surg; 50:114 – 115.
surgically assisted rapid maxillary expansion; Br J Oral Maxillofac Surg; 36:389 - 391. Silverstein K, Quinn PD. (1997) Surgically assisted rapid palatal expansion for the management of transverse maxillary deficiency. J Oral Maxillofac Surg; 55:725. Susami T, Kuroda T. Amagasa,T. (1996) Orthodontic Treatment of a Cleft Palate Patient with Surgically Assisted Papid Maxillary Expansion; Cleft Palate – Craniofacial Journal; 33 (5), 445 – 448. Takeuchi M, Tanaka E, Nonoyama D, Aoyama J, Tanne K. (2002) An Adult Case of Skeletal Open Bite with a Severely Narrowed Maxillary Dental Arch. Angle Orthod; 72:362–370. Rhinometric, Morphometric and Sonographic Investigation. J Orofac Orthop;62:107–15. Zahl C, Gerlach K. (2004) Fin-edge osteotome for submucous palatal osteotomy. British Journal of Oral and Maxillofacial Surgery; 42, 49-50. CRESTANELLO NESE, José P.; ARISMENDI, Carlos; FERNÁNDEZ LUZARDO, Claudio. Deficiencia maxiliar transversal en adultos. Controversias sobre la disyunción palatina rápida asistida quirúrgicamente.. Actas Odontológicas (Publicación discontinuada), [S.l. ], v. 5, n. 1, p. 15-22, apr. 2016. ISSN 2393-6304. 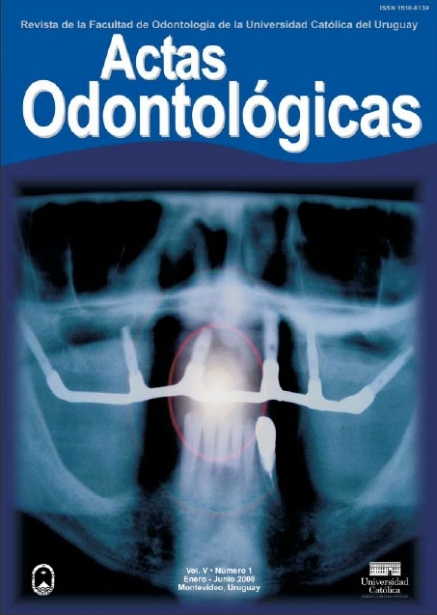 Disponible en: <http://revistas.ucu.edu.uy/index.php/actasodontologicas/article/view/1106>. Fecha de acceso: 24 apr. 2019 doi: https://doi.org/10.22235/ao.v5i1.1106.